4DryField® PH is a single medical device that provides adhesion prevention and haemostasis in one application. Find out more! 4DryField® PH is an innovative medical device for adhesion prevention and haemostasis that can be used in a wide range of surgical indications. Due to its physical properties, 4DryField® PH absorbs many times its own mass in liquid within a few seconds. 4DryField® PH is made up of sterile hydrophilic microparticles. These are manufactured from highly purified potato starch in a complex process. 4DryField® PH contains no components whatsoever of animal or human origin. It is biocompatible, pyrogen-free, and hypoallergenic. Therefore, 4DryField® PH meets the stringent requirements for a Class III medical device. There are no known side effects up to now. Occasionally, there may be a temporary increase in CRP with no leukocytosis and no increase in temperature. Find out more about how 4DryField® PH works here. If you have any questions on 4DryField® PH, you would like to discover new areas of application, or you’d like to share your experiences with 4DryField® PH, please feel free to contact us. You can find further information on the product and its use in the current 4DryField® PH package information leaflet. 4DFLapTM is a single use applicator for manual administration of 4DryField® PH in endoscopic and laparoscopic surgery. 4DryField® PH has a shelf life of 5 years. The product should not be exposed to any extreme temperatures. 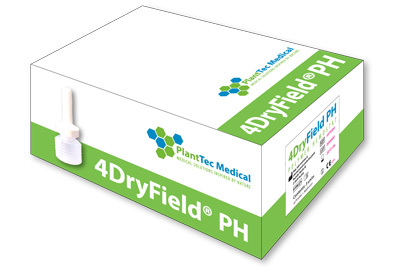 It is recommended that 4DryField® PH is used promptly after opening the applicator. Unused, non-sterile product must be disposed of. Bellows applicators with contents of 1 g, 3 g, 5 g or 9 g can be used according to the required quantity of product for a wide range of applications in all surgical disciplines.